World indoor singles champion Nicky Brett (second left) with three of the Parkway players who were among the honours at the Northants Federation presentation luncheon. From the left are Neil Wright (four-bowl singles and three-bowl triples), James Harford (two-bowl triples) and Howard Shipp (Champion of Champions singles). Some of the world’s top indoor bowlers, including world number one Nicky Brett and fourth-ranked Greg Harlow, are in action at Stamford IBC this weekend in the annual Nigel Kettle Memorial Open singles tournament which carries a first prize of £750. And waiting in the opening round for current world champion Brett is the club’s under 12 champion Owen Aspinall, who is only eight. On the next rink, Harlow plays club president Bob Warters, while Stephen Harris takes on Jamie Walker, who will be representing England in the outdoor World Championships in New Zealand later this year. Other leading players involved include world number 11 Mark Royal, the defending champion, and 15th ranked Les Gillett. The tournament starts at 6.00pm on Saturday and continues on Sunday from 8.30am. n Parkway player Michelle Barlow has been recalled to the England women’s outdoor team for next summer’s British Isles international series in Wales. Although she lives out of the immediate area, she has been attached to the Parkway club for several seasons. n Huntingdonshire Bowls hold their annual presentation luncheon at Slepe Hall, St Ives, this Sunday. n Brett and English Women’s Bowling Federation president Daphne Meats, from Hunts, were the guests of honour at the Northants Bowling Federation’s joint men’s and women’s presentation luncheon at the Haycock Hotel, Wansford, on Sunday. After proposing toasts for the men’s and women’s county federations respectively, they assisted county presidents Joan Robinson and Bob Warters in presenting the indoor and outdoor trophies. Pride of place at the presentation ceremony were the national champions from Skegness, Mick Duell (West Ward), who kept the veterans singles trophy in the county, and Darren Middleton and Stephen Harris (Blackstones), the county’s first winners of the under 25 open pairs. Harris also reached the final of the under 25 singles. Singles – Joan Robinson; r/u Chris Ford; Senior singles – Joan Robinson; r/u Shirley Suffling; Pairs – Fiona Richardson & Julie Masters; r/u Jenny Harvey & Carol Hunter; Triples – Jan Want, Shirley Suffling, Chris Ford; r/u Joan Robinson, Margaret Bloxham, Moira Holdroyd. Singles – Derek King; r/u Doug Want; U25 singles – Stephen Harris; r/u Joshua Clark; Senior singles – Martyn Dolby; r/u Peter Edwards; Pairs – Nick Wilkie & Joe Randall; r/u Adam Warrington & Martyn Dolby; Mixed pairs – Chris Ford & Martyn Dolby; r/u Moira & John Holroyd; Triples – Stephen Harris, Cliff Watson, Peter Edwards; r/u Adam Warrington, Jon Earl, Martyn Dolby; Mixed triples – Chris Ford, Adam Warrington, Martyn Dolby; r/u Fiona Richardson, Neil Wright, Simon Law. 2b singles – Sheila Craig (Conservative); r/u Fiona Richardson (City of Peterborough); 4b singles – Sarah Newson (Parkway); r/u Sue Moir (Langtoft Pearl); Champion of Champions – Joan Butcher (Whittlesey Town); r/u Chris Pell (Crowland); Senior singles – Norma Squires (City of Peterborough); Viv Hempsell (Yaxley); Secretary’s singles – Linda Darani (City of Peterborough); r/u Pearl O’Brien (Deeping); Under 25 singles – Louise Harris (Blackstones) received a walkover); Pairs – Sarah & Val Newson (Parkway); r/u Karen Martin & Julie Masters (Parkway); Senior pairs – Pat Bussey & Sheila Craig; r/u Shirley Suffling & Chris Ford; 2b triples – Carol Warters, Shirley Suffling, Chris Ford (Ketton); r/u Peggy Birch, Elaine Upton, Val Du’Kett (Ketton); 3b triples – Carol Warters, Shirley Suffling, Chris Ford (Ketton); r/u Jenny Harris, Rita Downs, Sharon Bailey (Blackstones). 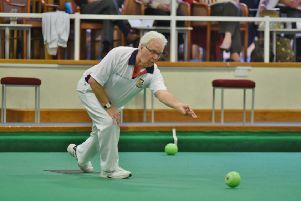 2b singles – Peter Cox (Langtoft Pearl); r/u Graham Agger (Yaxley); 4b singles – Neil Wright (Parkway); r/u Martyn Dolby (Blackstones); Champion of Champions – Howard Shipp (Parkway); r/u Graham Agger (Yaxley); Veterans singles – Mick Duell (West Ward); r/u Norman Hill (Yaxley); Secretary’s singles – Malcolm Squires (City of Peterborough); r/u Mike Ramsden (Empingham); Under 25 singles – Stephen Harris (Blackstones); r/u Jack Corney (Whittlesey Manor); Under 25 open pairs – Darren Middleton & Stephen Harris (Blackstones); r/u Zack Brown & Jack Corney (Whittlesey Manor); Pairs – Nick Wilkie & Paul Buckley (Blackstones); r/u Sean Fenlon & Jim Ruddy (West Ward); Senior pairs – Graham Jackson & Roger Martin (City of Peterborough); r/u Malcolm Cullingworth & Richard Montgomery (Langtoft Pearl); Mixed pairs – Chris Morton & Simon Law (Parkway); r/u Ann & Malcolm Cullingworth (Langtoft Pearl); Senior mixed pairs – Linda & Tony Kemp (Conservative); r/u Linda Darani & Roger Martin (City of Peterborough); 2b triples – Stuart Reynolds, James Harford, Mike Robertson (Parkway); r/u Terry Corney, Terry English, Stewart Wilson (Whittlesey Town); 3b triples – Neil Wright, Ean Morton, Simon Law (Parkway); r/u Paul Dalliday, Roger Stevens, Martin Welsford (Whittlesey Manor); Mixed triples – Sarah Newson, Peter Brown, Val Newson (Parkway/Whittlesey Manor); r/u Jenny & Trevor Harris, Paul Bailey (Blackstones). Danny Duffy Trophy – Blackstones; r/u Yaxley; Adams Cup – Parkway; r/u City of Peterborough C.